Preparation time: About 45 minutes active. Start to finish 5 to 8 hours. I prefer this soup cooked all day in a slow cooker, but you can certainly cook the beans in a pressure cooker in about 30 minutes. If you cook the beans in a regular pot on the stove, they will cook in 60 to 90 minutes, depending on altitude and climate. Cook’s Tip: Asafetida purchased at Indian grocers is cut with wheat. However, gluten-free asafetida is now available online and in many cities nationwide at Savory Spice Shops. 1. 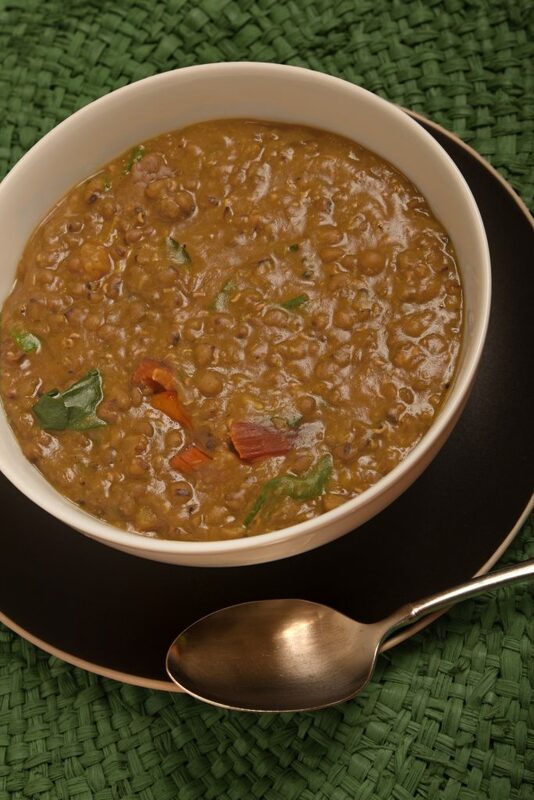 Rinse the beans, strain them and place them in a slow cooker with water and the bay leaf. Turn the cooker to the high setting. Start with 8 cups of water unless you will be away from the cooker for 6 hours or longer; in that case, start with 10 cups of water. If you are home, you can reduce the heat to low once you see the beans start to split, which will take 4 to 5 hours on high. If you are going to be away from the cooker for 6 hours or longer, start the soup on high for as long as possible — at least an hour, two hours even better — before turning it to low. When cooked on high, the soup can be ready in 4 to 6 hours (depending on altitude and climate). When cooked on low, it will take 8 hours or longer. 2. About 45 minutes before serving the soup, prepare the onion. (If you are omitting the onion, skip to #3 and 4). Chop the onion. In a medium sauté pan, heat oil on medium heat. When the oil is hot, add the mustard seeds and cover until the seeds pop like popcorn. Reduce heat to low or remove the pot from the heat source. Add asafetida (if using) and onions. Once they turn uniformly golden (about 10 minutes), reduce heat to medium-low and continue cooking another 20 minutes or so. When they onions are brown and caramelized (but not burned), add the ground spices to the onion mixture and stir for a few seconds. Then pour the mixture into the pot of beans. Ideally, let the spices flavor the soup for at least 5 minutes before serving. 3. Chop some of your favorite greens, a sweet potato and a zucchini. Steam them in batches, one batch for each vegetable, and then add that batch to the pot. Steam the potatoes for 10 minutes. Steam the greens for 6 to 8 minutes until tender (longer for kale) and zucchini for 6 to 8 minutes. 4. If you are not using an onion, heat the ghee or oil in a small spouted pot, if possible. When the oil is hot, add the mustard seeds and cover until the seeds pop like popcorn. Reduce heat to low or remove the pot from the heat source. Add asafoetida and the ground spices to the ghee, and stir for a few seconds. Then pour the mixture into the pot of beans. Ideally, let the spices flavor the soup for at least 5 minutes before serving. 5. Finish the soup by adding ginger, garlic and salt to taste. Stir well. Serve each bowl with a small handful of cilantro and a splash of lime. This has become a lunchbox thermos favorite! Thank you! Thanks, Sally! Since you’re a seasoned Ayurvedic practitioner, I’m doubly excited to hear this! Wonderful soup! Not only is it favorful, but it very grounding. A hearty soup for a cold day.